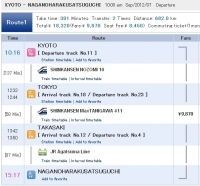 There is no direct route between Kansai ( Osaka, Kyoto, Kobe etc…) and Kusatsu Onsen. When you come to Kusatsu Onsen from Kanasai, usually you should go to Tokyo once. Then you go to Kusatsu Onsen by Shinakansen, Limited Express Kusatsu, or local train. 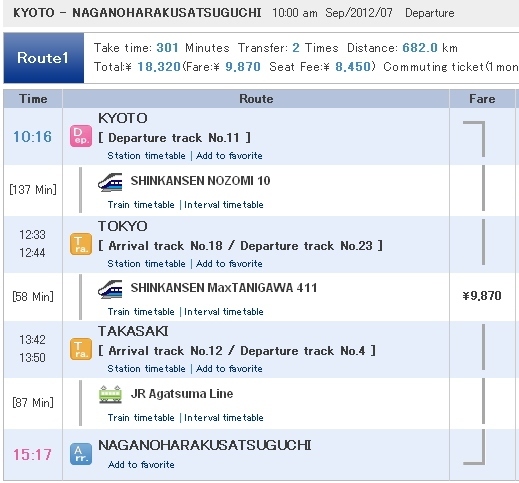 If you depart from Kyoto at 10:00am, you can arrive to Naganohara-Kusatsuguchi at 15:17pm. And you should change to the local bus for Kusatsu Onsen, Then you will arrive to Kusatsu Onsen by 16:00pm. If you have not a JR Rail Pass, and you want a cheaper traffic, you can use JR Highway Bus “Joshu-Yumegurigo”. In this case, you should go to Shinjuku Station by JR Chuo Line from Tokyo Station.